Sat, August 11, 2018 1:00 P.M.
Local farmers, Hani White and Syarif Syaifulloh, will work with fresh herbs and vegetables from their South Philly harvests. Together, participants will make gado gado, a delicious and nutrient-dense salad from Indonesia that features late summer crops. 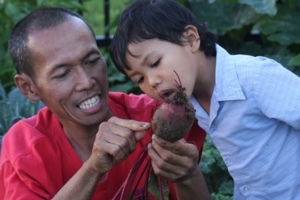 This family-friendly class welcomes children and their caregivers to the table for hands-on cooking and read-aloud of Haiqal's Garden, a bilingual book that celebrates a father-son relationship and a beautiful backyard garden with food grown to nourish the community. Preregistration is required via Eventbrite; tickets are $5 per person. Photo of Syarif and Haiqal Syaifulloh, courtesy Morning Circle Media.